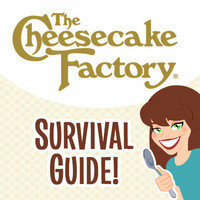 Do NOT head to The Cheesecake Factory without reading this first... We've got the best picks, shocking high-calorie skips, and more! The Cheesecake Factory doesn't provide full nutritional stats: just calories, saturated fat, sodium, and carbs. (That's why we couldn't calculate the PointsPlus® values for these menu items.) Still valuable info! The name of the game here is SkinnyLicious. Nearly every item on the SkinnyLicious menu (which may or may not have SkinnyLicious in its official name… confusing!) has less than 600 calories. The only exceptions? The 640-calorie SkinnyLicious Fresh Vegetable Salad with Chicken and the 810-calorie SkinnyLicious Caesar Salad with Chicken. 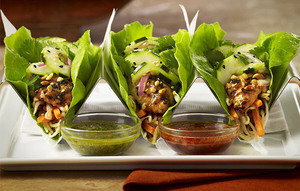 If SkinnyLicious is in the name of your dish, don't forget to say it when ordering. 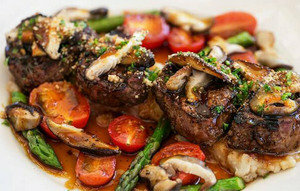 There are regular versions of some of these meals elsewhere on the menu, and you could end up with a much higher-cal dish. In case you're unaware, The Cheesecake Factory's menu is massive. Rather than dissect it line by line, we've called out some of the best picks in different categories, plus shocking high-calorie skips! 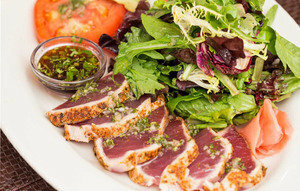 Looking for the nutritional 411 on a menu item not listed here? The Cheesecake Factory website doesn't provide these deets, but we've got you covered... Click here to download the official Nutritional Guide! As with the majority of chain restaurants, most of the sodium counts on the menu are high. If you're closely watching your salt intake, you may want to limit dining out altogether. And check out these sodium-slashing hacks. If you feel the need for some pre-meal grazing, skip the bread and order some edamame for the table. Since you have to shell the beans, you won't wolf 'em down too quickly, which is always a bonus. Some of the appetizers are no-brainer calorie disasters. Fried Macaroni & Cheese? Obviously. Southern Fried Chicken Sliders? Doy. This corn-based app -- inspired by tamales, which are typically steamed or boiled -- sounds practically virtuous in comparison. But the cakes are fried and smothered with fatty toppings! Pass. P.S. The Fire-Roasted Fresh Artichoke is still as bad as ever -- click here for a DIY swap. Fresh, healthy... fantastic. With greens and other veggies, this salmon salad is dressed with the super-tasty SkinnyLicious Vinaigrette. Go for it. This one's more fun than the name suggests! It's got asparagus, roasted beets, edamame, radicchio, apple, white cheddar cheese, and more. To slash some sodium, trade the vinaigrette for plain vinegar with a splash of oil. This thing is hard to resist. It's got chicken, avocado, bacon, corn, blue cheese, apple... Yes! Skip the bacon and/or blue cheese to shave off calories and sodium. HG tip: If you go with a standard salad, skip the default dressing. Ask about the SkinnyLicious dressings, and get one on the side. HG menu hack: Ask if you can get a side of veggies instead of that angel hair pasta. Then mix it in with the extra sauce and asparagus. Then this dish will have even fewer calories and more fiber -- mega score! That's right, enchiladas. CF's regular Chicken Enchiladas have 1,340 calories and 21g saturated fat. Not these! Topped with red chile sauce, shredded cheese, and corn salsa, these also come with Mexican-style marinated veggies. "Sautéed Chicken Breast with Lemon Sauce, Mushrooms and Capers. Served with Angel Hair Pasta." You'd hardly guess from that description this is a 2,000-plus-calorie entrée. And you'd likely be stunned to learn this meal has more calories than the Famous Factory Meatloaf with its gravy and mashed potatoes. Yikes. * There are no calorie listings for the SkinnyLicious cocktails (boo), but they've been promoted as having 150 calories or less (yay!). 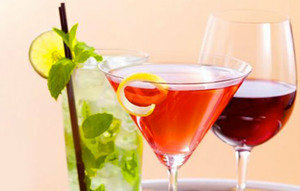 Choose from Skinny Red Sangria, Margarita, Mojito, Cosmopolitan, and Long Island Iced Tea. * CF's nutrition guide lists wine as 120 calories for 5 ounces... but then admits their pours are 6.5 ounces. So that's more like 156 calories per glass, FYI. * A regular 12-oz. beer has 150 calories; a light beer has 100 calories. Just how bad are the cheesecakes? 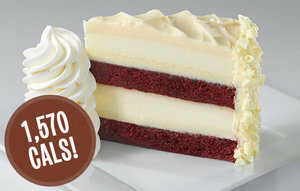 The regular cheesecake slices run from 830 calories (for the Original) to 1,570 calories (for the Ultimate Red Velvet Cake Cheesecake). The Low Carb Cheesecake isn't much better, with 620 - 630 calories per slice. Head home for a piece of HG-style cheesecake instead! A shockingly good find... We love that there's a Bowl of Fresh Strawberries on the menu! Served with a side of whipped cream, the whole thing has 250 calories and 11g saturated fat. Pair that with a coffee sweetened with no-calorie sweetener, and you're all set. P.S. Word on the street is that CF is adding a "Superfoods" section to its menu. No word yet on nutritional info or specific items, but we’re excited to learn more!